After a long time working on resources for on-line learning, delivery of training and Assessment, it has finally arrived “The IPad”. I must admit it has only been three years since starting the e-learning projects not that long in the scheme of things, I guess. Well here it is, so far yes I can attendance track students, result them from practical projects and units completed via the SIS tafeSA systems. All good. But what about the work side of things, the word documents, really, can’t this be sorted out, have Apple and Adobe and Microsoft forgotten who their customers are. May be they have by the look of Microsoft’s profit forecasts or should we say loss forecasts. So many loyal customers just wanting to use Flash, Word & other simple everyday products. Yes you can use Google docs, text editor that look like word processors but there is always something that makes it difficult. The tafeSA Moodle site runs ok and things appear and function until I get to the assessment tools. Match the answers (flash bases) SWF file, no go. I really hope the “PC based Surface” release will fix these annoying little things and help them all remember that the customers are the first thing that Apple, Microsoft, Adobe etc should consider after all we buy and use the products and business buys a lot of hardware and software. The potential for the IPad, Surface, Android tablets is great in eduction, but I still feel they are babbling at the edges yet. I have tried, Tablet computers, Nexus One Smartphone, IPhone, Android tablets and now the IPad and found them wanting still. Better but still not quite there for everyday office use. This entry was posted in CPSISC Coop, RPL, tafeSA, Training, Wall & Ceiling Lining and tagged gilles plains, iPad, on-line learning, tafeSA, training, uses, Wall and ceiling lining. Bookmark the permalink. 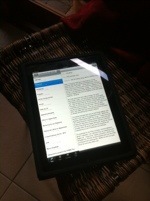 The IPad has now been updated to an IPad II as a part of a feasibility study for the BCF unit of tafeSA. It is a better machine though only slightly faster the internet is an improvement. The main issue is that you still cannot work on Office documents directly as on the laptops but this is balanced out by the incredible weight of the laptops and their associated chargers and leads. Another issue is that there are no USB connection for quick transfer of files and images etc and that the level of expertise across the new users is not as high as would realise the incredible benefits that they offer. “But” They reall really really need to fix that stupid Flash drama so we can play SWF functions to upload images and run tests and quizzes on Moodle… Bye..for now.